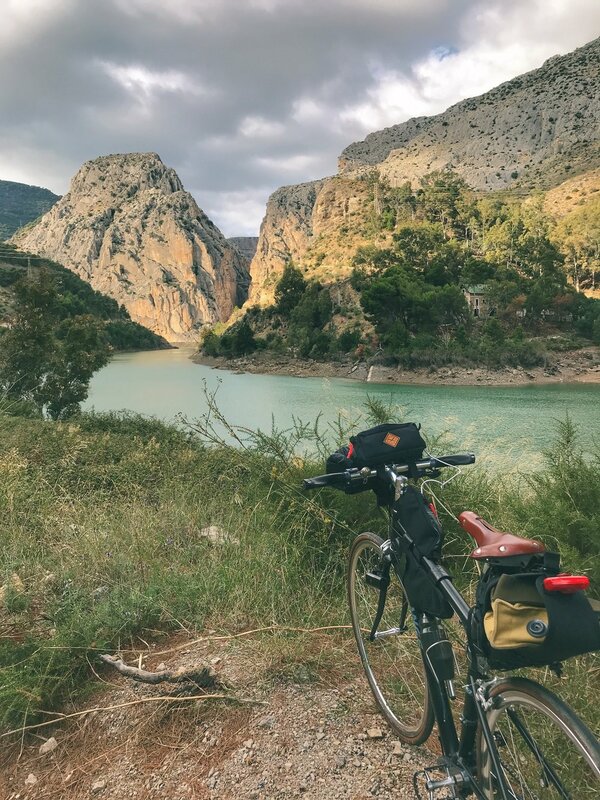 This is the last part of the series of our cycling journey through Andalucía. 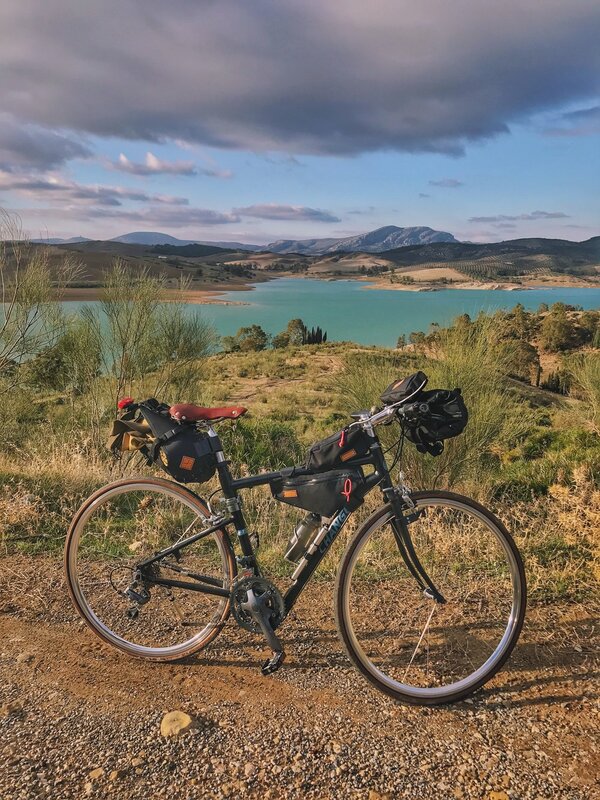 This post is a continuation from Cycling Andalucía, Spain – Part 2. The early morning in Antequera was shrouded in mist and gave us a very chilly start for the day. After a hearty breakfast, we bid farewell to our abode and cruised past the center of town, taking the road that lead us back into the countryside. And just like any of our previous days and in classic Spanish riding style, the climbing started quite early on, almost immediately after barely leaving the outskirts of town. As we made our way up the many switchbacks, the clouds were moving quickly above us as we pushed through a few short gusts of wind. Along the way up, we spotted several old Roman ruins, and the one that was most clearly visible and recognizable was this old Roman bridge that lead to what looked like a hiking trail. After going up several hills and a few rolling plains, we made it to the other side and took a quick break at a lovely vantage point. We passed through the village of Valle de Abdalajis, winding through its narrow roads and enjoying the close proximity of the pueblo blancos to each other, with the earth tones of stone and brick accentuating the quintessential architecture that is staple to the region. As we headed further west from Valle de Abdalajis, the roads kept going upwards into the mountain. It was a long and arduous climb, with one steep hill after another. We took several breaks between all the climbing to enjoy the scenery, with orange and lemon trees accentuating the raw beauty of the countryside. Finally at last, we completed the series of what felt like unending climbs and reached the valley where the Rio Guadalhorce flowed. We made a slow descent towards the river and grabbed a bite to eat along one of the many eateries along the riverbank. There just happened to be a two tour buses that somehow got stranded and created a bit of a traffic jam along the narrow road, while we blithely went past them all on our two wheels. After our meal, we continued following the river until we reached the Garganta del Chorro, or El Chorro for short, a natural cleft in the limestone rock face, carved over time by the waters of the Rio Guadalhorce. What made it even more amazing (and gut wrenching) was the small hanging bridge that was suspended 400 meters high, spanning across the two walls of the limestone cliff side. This small bridge that spanned across the gorge was built during the construction of the dam between 1914 and 1921. It was officiated by King Alfonso XIII of Spain in 1921, and on that day itself, the king took his first steps along the specially constructed walkway pinned to the face of the gorge, which was thereby named Camino del Rey (the King's path). Camino del Rey sits 100 meters above the river and is about a meter wide, and for years it was prohibited for anyone to walk on it after several deaths. The walkway has undergone immense reconstruction and was reopened in May 2015 to the public. For those who are not afraid of heights, it’s quite an amazing walk to experience. 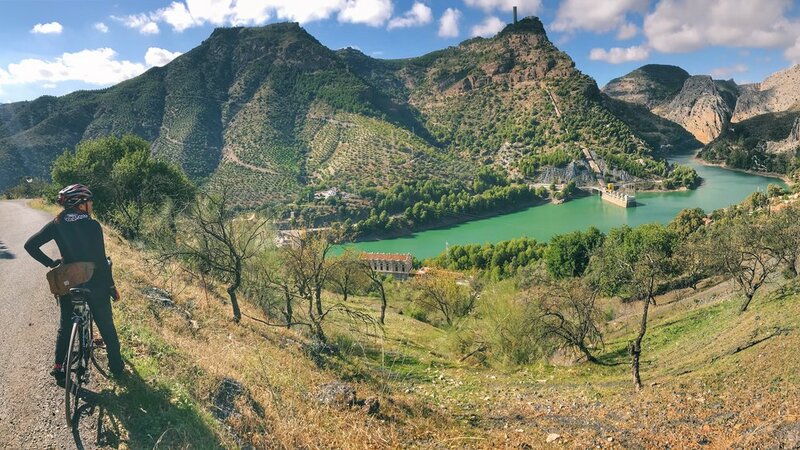 We continued through a series of short climbs and emerged on the other side, coming into contact with the Embalse del Conde de Guadalhorce with its beautiful turquoise blue waters. During weekends, this natural park area is a great place for families to gather. This lake is connected to two greater lakes on the other side where kayaks and canoes can also be rented. For the moment, we basked in the sunlight of the golden hour and enjoyed some light snacks that we brought with us on our bikes. After enjoying our lakeside moment, we continued with our last climb for the day, climbing up the Sierra de la Pizzarra in order to reach our destination for the day. The beautiful old town of Ardales awaits, its ruins of an old Moorish alcazar still clearly visible. There are also remnants of Roman and even Neolithic remains strewn around the area. 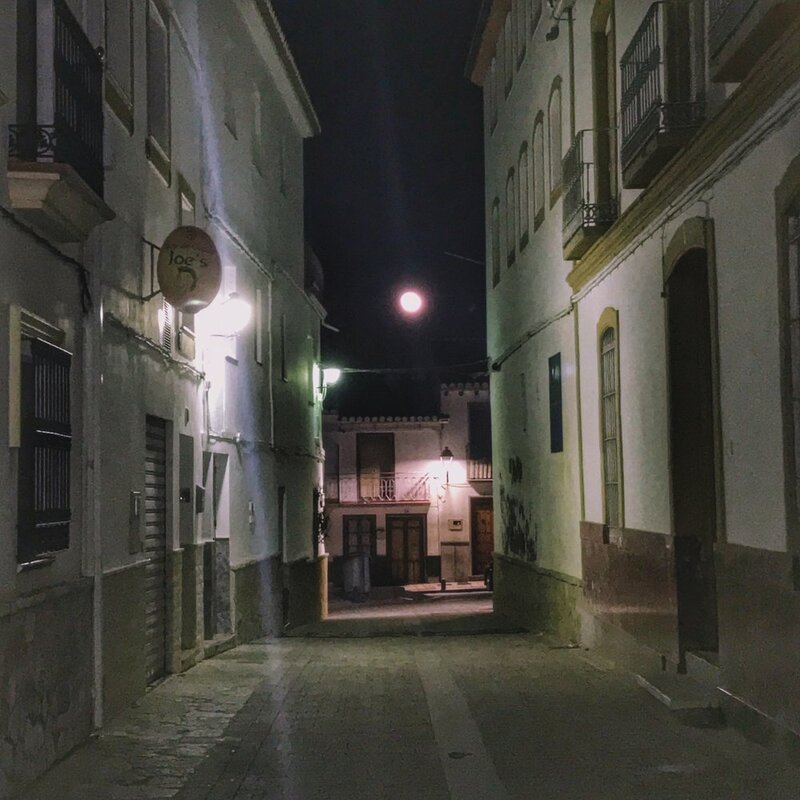 We checked in for the evening in a quiet apartment and then enjoyed a stroll through the town plaza under the light of the full moon. This day would be the fifth and final stage of our cycling tour through Andalucía. Out of all the trips that we’ve been on, this has definitely been one of the most challenging ones to date, and of course this last stage was not about to disappoint! We had an early morning start from our quaint apartment, and as usual on every day of our trip, it started with a climb! It’s pretty much cemented itself as tradition at this point. We followed the quiet road up through the Sierra and ran into a few herds of goats along the way. Not too far from the road we were riding on, you could catch glimpses of the Rio Turón as the morning sunlight shimmered across the rippling waters, appearing as speckles of gold in a dramatic landscape. This area of Andalucía with its beautiful countryside and spectacular vistas has also been known to be bandit country. Mountainous and full of ravines, caves and hidden valleys, Andalucía has naturally made itself a great place for people who are on the run from authority in one way or another. There have been many tales of bandits across time – the bandits or bandoleros of Andalucía – these tales attracting 19th century Romantic travellers such as Byron and Washington Irving to tempt fate as they traveled through the Sierras by coach, hoping to meet such bandits. In the 9th century, it was the tale of Omar ben Hafsun, a sort of Islamic Robin Hood. Somewhat rebellious, he was involved in many disputes, but in one such incident in 879 he ended up killing one of his neighbours which led to him being disowned by his father. As a result, he gathered together a band of followers and headed for the hills and a life of banditry. Eventually, he was captured but he managed to escape to Gibraltar. In 884, Omar Ben Hafsun made his return to the region and became part of a rebellion against the Emirate of Cordoba, making his base in the ruins of the old Bobastro castle high up in the most inaccessible area of the Guadalhorce mountains. In the 18th century, the colorful character of Tragabuches of gypsy stock fled to the mountains and took up a life of banditry upon killing his adulterous wife. An admirer of Torero Pedro Romero, he dedicated himself to bullfighting. Tragabuches inherited his name from his grandfather who once ate a donkey fetus for a bet. In the 19th century, it was the turn of the bandoleros, bandits who preyed on the rich and who became almost folk heroes of the time. It was the activities of these bandoleros that led to the formation of the Guardia Civil in 1844, and many bandoleros were subsequently forced into the service of the caciques (local landowners) or even of the Guardia Civil itself. As we approached our midway checkpoint of El Burgo, the landscape completely transformed from jagged limestone to a beautiful sanctuary of pine trees. This area is a nature park reserve and is also known to have its own unique species of pine growing. We took it slow and immersed ourselves in the forest, enjoying the fresh pine scent. On the other side of the pine forest, we emerged once again into the rolling countryside, winding past wild rocks, lemon and orange groves, and rows of olive trees and almonds. 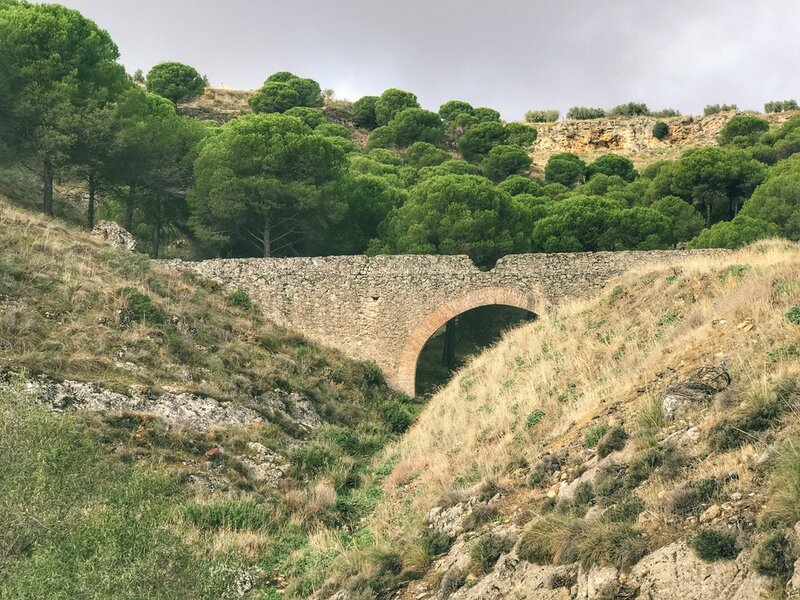 We quickly glide over the still used Puente Romano (Roman bridge) before we make our first stop at El Burgo – a small village built on a hill 500 meters high. Once we reached El Burgo, we had a quick snack of tostadas con queso, while Nadiah managed to have a quick conversation with one of the other travelers there. A man spotted our bikes and asked where we were going, and we told him that we were heading to Ronda. Apparently he just drove down from there so he knew the road that we would be taking. “You are masochists, no?” All we could muster was a sheepish smile. Just in case, we also loaded up on some Snickers and M&Ms before we continued on our journey. We were going to need the energy! Sure enough, there was a climb immediately right out of El Burgo. We took it nice and slow as we continued climbing to the next Sierra. The road we took led us through the Sierra de las Nieves Natural Park, a beautiful pocket of lush greenery in the rocky landscape of Andalucía. This Natural Park has been declared by UNESCO as a Biosphere Reserve, and has also been known as a place of mystery with deep ravines and home to bandoleros of the past. The only price of admission was the number of climbs we had to go through, and pretty soon we realized we went through half of our sugar stash already. For those coming to this area by car, there are plenty of parking spots with vantage points that also lead to some really great hiking trails. After completing the Sierra de las Nieves climbing stage, the roads opened up once more to the raw and jagged limestone formations that we have become so familiar with over the last week or so. There was still plenty more climbing to be done, but at least it wasn’t too steep. Once we passed the aptly named Puerto del Viento (Doorway of wind), it was a fast and beautiful descent towards Ronda. 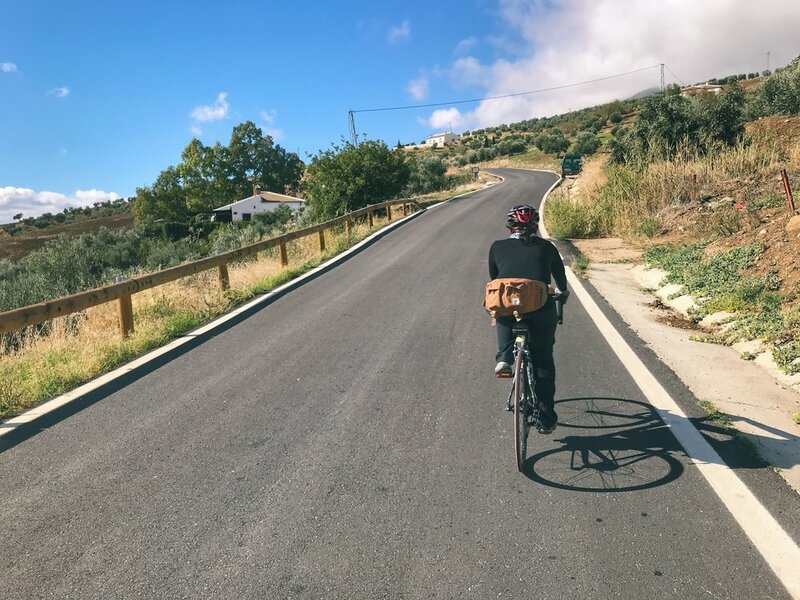 As we quickly rode past the curves and corners of the winding mountain road, we were able to catch glimpses of Ronda between the rocky landscape, surrounded by the Sierra de Grazalema. The road eventually followed the train line as we got closer to Ronda, cutting through fields and vineyards. We zoomed past the remains of a 4th century Roman aqueduct, enjoying a bit of the evening breeze and the golden light of the setting sun. We also met other cyclists along the way who were enjoying their early evening ride around the Ronda countryside. At last, we arrived at our destination of lovely Ronda, a beautiful and historic city that has to be seen to be believed! 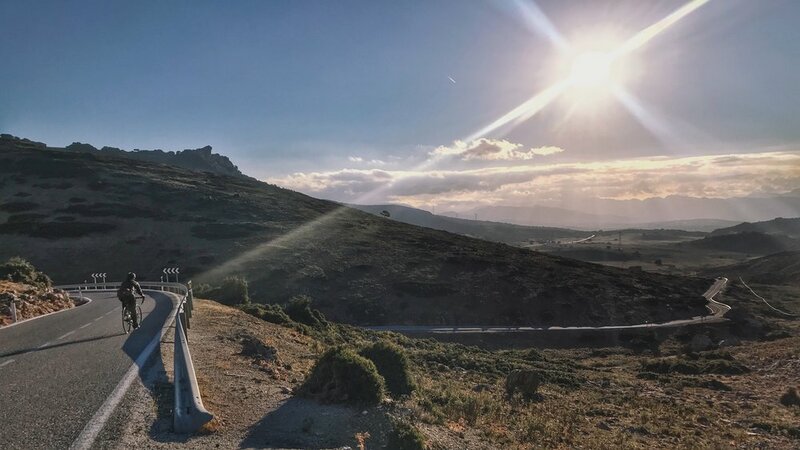 "In the middle of the bizarre mountain range of Serranía de Ronda, at the edge of a canyon of a depth of 120 meters, you will find Ronda – certainly one of the most incredible places in all the land. Nothing in all Spain is more surprising that this wild town" – Czech poet and writer Rainer Maria Rilke. The history of Ronda can be experienced through its architecturally majestic bridges such as the Puento Nuevo, its old Moorish city walls that have stood the test of time, Roman villas within striking distance, and Spain's very first established bullring in the heart of the city. The well preserved homes of Moorish nobles such as the Palacio de Mondragon can also be seen! Although a small city, it has all the quintessential elements of archetypical Spain with the cultural flair and flavor of Andalucía, showcasing its many beautiful restaurants, plazas and cafes perched on the most unbelievable gorge with wonderful vistas of the surrounding mountain ranges. It is no wonder that Ronda has attracted Romantic travellers from the 19th century, and also the muse for Hemingway that inspired his first bullfighting novel, "The Sun also Rises." Ronda is also the final resting place of Orson Welles whose ashes were laid to rest here. There are wonderful open air museums all around that also includes one of the best preserved bath houses from the Moorish times of Al-Andalus. We only had an extra day to spend at this wonderful place, but if we were to do it again, I can imagine that you could easily spend an entire week exploring Ronda. For hikers, there are a number of beautiful trails that snake along the gorge and up into the nearby mountains, and we already know this to be cycling paradise with its beautiful and tranquil countryside roads. Since you’ve made it this far, here’s a video that captures the essence of our ride! Dear Andalucía, we miss you very much, but we will certainly be back again! Hasta la vista!